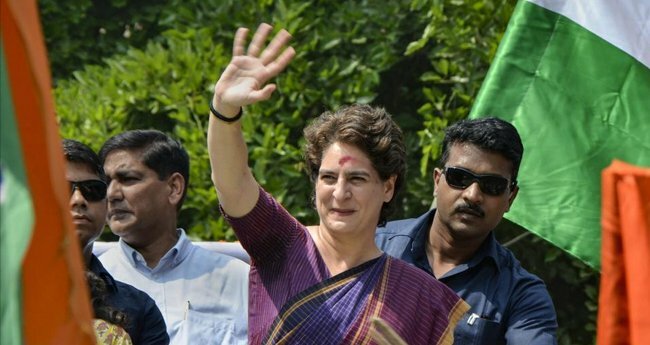 Silchar (Assam): Coming down heavily on the BJP, Congress leader Priyanka Gandhi Vadra on Sunday said the Constitution is not respected and an attempt is being made to destroy it by the present dispensation. Holding a roadshow in Silchar in support of Congress candidate and sitting MP Sushmita Dev, she also said that Prime Minister Narendra Modi has toured the world over, but hardly spent time in his own constituency in Varanasi. "It is ''Mahapurush'' (B R) Ambedkar ji''s birth anniversary. He laid the foundation of this country through the Constitution. It is the duty of every leader to respect that Constitution. "Today, you are seeing that the Constitution is not respected and an attempt is being made to destroy it," said Gandhi, who is Congress''s general secretary in-charge of Uttar Pradesh East. Slamming the the BJP manifesto, she said there is no space for different cultures and religions in it, as well as any respect for the Constitution. "On the other hand, the Congress manifesto has the ''NYAY'' scheme, under which a poor family will get Rs 72,000 annually... In every word, there is respect for the Constitution," she said. Gandhi said she was told by people in Varanasi that Modi did not spend even five minutes with anyone there in the last five years. "He went to America and hugged there, went to China and hugged there, too. He went and hugged in Russia and Africa. He went to Japan and played the drum. In Pakistan, he had biriyani. "But in his own constituency, he did not go once to a family''s house to enquire about their condition," she alleged. The Congress leader appealed to people to defeat the BJP-led government, which she said does not listen to public voice, does not try to understand their problems, does not believe it is peoples'' governance, and only wants to enjoy power. Speaking highly of Sushmita Dev, Gandhi likened the Congress lawmaker with her grandmother and former prime minister Indira Gandhi. "If you remember Indira Gandhi even today, it is because she worked for you. I have come here for Sushmita. She has that courage which Indira ji had. Sushmita has that honest and good intention, and wants to work for you from the heart," she said. Gandhi also criticised the BJP-led NDA government for its "flawed policies and intentions" in the last five years, and cited the withdrawal of the Special Status to Assam, snapping of the north east-specific industrial policy and suspension of two paper mills in the state. "They (BJP) are doing various kinds of publicity. They are good at that. In UP, I have been meeting youths, farmers, professors and others. Youths are jobless. Farmers are in distress. Women are unsafe. Scores of problems are there that were never addressed," she alleged. Gandhi urged people to read the party manifestos carefully before deciding to vote for a candidate. "Aware and inform yourselves. See which party and leader is saying what. Support that leader only who works for you and make him or her victorious," she added.